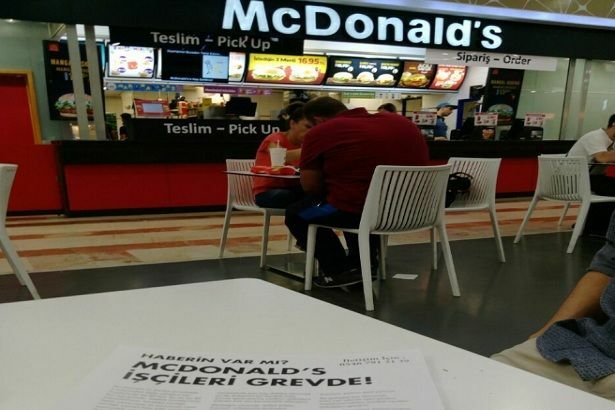 Communist Party of Turkey declared its support for the McDonald’s workers’ strike and distributed leaflets in McDonald’s restaurants in Turkey. The leaflets announced that McDonald's has over 1 million employees throughout the world and 85 thousand of them who work in Britain are on strike. It vocalized the demands of the workers for higher hourly pay, union rights and an end to slavish treatment of bosses. Member of the CC of the CP of Turkey, Gülçin Uz, explained that every movement of the working class in the world has a reflection in Turkey and the CP of Turkey is embarking on organizing workers in many sectors such as food, textiles, metal and sanitation. The Party founded in 1920 is carrying the historical struggle today with the motto ‘The system will fall, Socialism will prevail’.